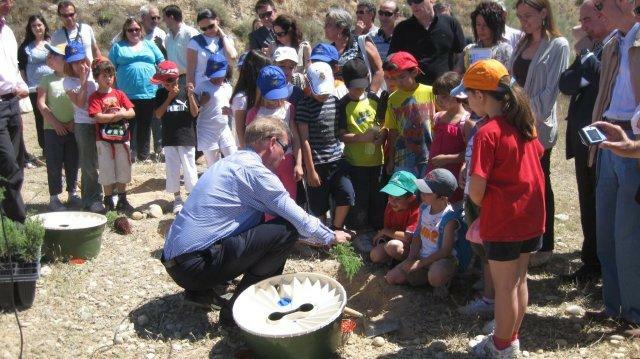 On the 3rd of June 2010 Groasis Spain & Transfer Consultancy launched a new reforestation project with the Groasis Waterboxx in San Mateo de Gállego (Zaragoza). A broad number of people, including the Mayor of San Mateo de Gállego, mayors of other municipalities in the region and several technicians interested in innovative technological solutions for the agricultural and forestry sector attended the event. During the official part of the event speakers as Pieter Hoff (Inventor of the Groasis Waterboxx), Jesús Villagrasa (Mayor of San Mateo de Gállego), Eva Crespo (Secretaria General técnica de la Consejería de Agricultura del Gobierno de Aragón) and Sven Kallen (coordinator of Groasis Spain and lead partner of the Life+ project "The Green Deserts") all underlined the importance of the Waterboxx for Spain. During his presentation Mr Jesús Villagrasa stressed the value of reforestation for Spanish municipalities. In his opinion the Groasis Waterboxx has a high ecological as well as an economical value. Reforestation leads to restoration of nature, maintenance, harvesting and processing and thus to more green jobs in Spain. This green employment can be a valuable contribution to improving the current negative economical climate and the high unemployment rate in Aragón and Spain. Pieter Hoff mentioned in his presentation that: “A day like this shows that the Groasis Waterboxx not only is an innovation on paper, but in reality can contribute to a revolution in Spain, both economically and ecologically”. Eva Crespo, from her position as the technical agriculture board of Aragón, focussed on the high value of the Groasis Waterboxx for the Comunidad de Aragón that is so much affected by drought and desertification. As an example she mentioned the contribution that the Waterboxx can have in reforesting large parts of the Los Monegros area. This region suffers from high summer temperatures, forest fires and extreme droughts and is now known as Europe´s largest desert. Besides the presentations, during the ceremony an official document was signed between the municipality San Mateo de Gállego and Transfer Latin Business Consultancy. This document confirms the participation of the municipality in the Life+ program that will start in September. Sven Kallen, coordinator of the Life+ project, expects the participation in this EU programme to become an important incentive for the development of a green economy for Spain. He stated that the project, which will take place in 5 different regions in Spain, will create positive effects for the participating entities. For example, the prevention of soil erosion, the rehabilitation of desertified rural areas, better flood prevention and in general the improvement of the soil and yields of crosps, thereby increasing the economic returns of forestry and agriculture activities. 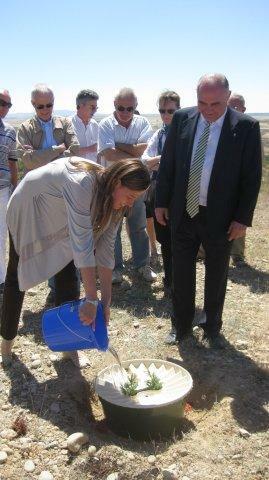 After the official part of the event, several trees were planted symbolically with the Groasis Waterboxx. For the planting of the trees Pieter Hoff was assisted by more than 20 children. These children surprised the public with their enthusiasm for trees and nature. Their presence at the event underlined the urgency for reforestation of Spain and shows that measures should be taken to assure a green Spain for the next generations. This article about the event was published in the Spanish press. If you want to know more about the Life+ project or the Groasis Waterboxx, please do not hesitate to contact us.